Card design from a watercolour and ink painting. Blank inside for your own message, each card is a little smaller than 5" x 7" and comes wrapped in cellophane together with a scarlet envelope. Free postage to UK addresses. 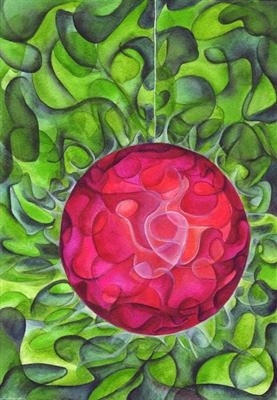 For multiple orders, have a look at '10 x Red bauble in a green field' or contact me. These cards are litho printed onto 350gsm trucard with a silk finish. They are blank inside for your own message, and each come individually wrapped in cellophane together with a scarlet envelope. The colours come into their own in the evening light, when they really seem to glow.